My youngest daughter has had many Christmas shirts, pajamas, and dresses handed down to her, but my oldest didn't have one Christmas thing. 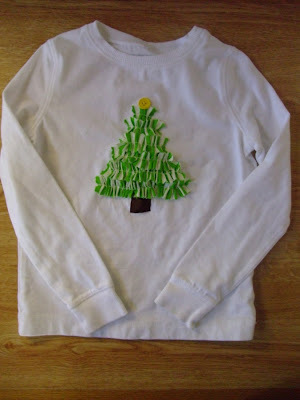 So, I made my her an appliqued Christmas tree shirt. 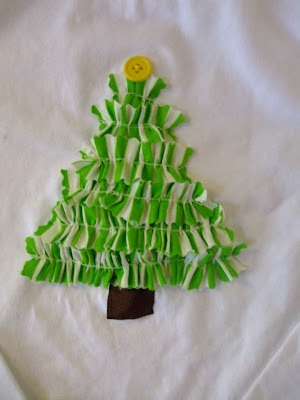 I think I saw the ruffle Christmas tree idea somewhere last year, but I can't remember where. I originally wanted to use ribbon for the tree, but I ran out of green ribbon. I had this green fabric, so I decided to cut it into strips with pinking shears and gather it, then sew the strips in rows on the shirt. I used a button for the star and a piece of brown ribbon for the trunk. Alison I am so glad that you are keeping our blog alive. You are so talented and creative. I am blessed to have you as my friend.